I live in Bomdo1 (http://tinyurl.com/bomdo-village), one of the oldest among the Adi community inhabited villages in central Arunachal Pradesh. There are several things I am interested in telling you about my tribe; we cultivate rice, millets, corn, vegetables and edible tubers in the slopes of the hills that surround our village, we follow the Donyi Polo religion and are basically animists. Though we don’t have a written script for our language, we have names in our Adi language for everything you may see around our village and in the forests; different types of moths, birds, stones, trees, insects, bats, mammals and everything else. I could go on and on but this account is mostly about a hunting trip I made to the banks of the Angong river. This year too as every year we have set up temporary hunting camps a days’ walk away from the village. From the months November till February we venture fortnightly in small groups of three to four people into forests that extend from right below the 3000 m tall Mouling peak to those adjoining the mighty Angong river. During these five months we target large-bodied animals like barking deers, serows, wild pigs and bears and bring the meat back to the village for the Aran festival2 in the last week of February. In this festival its our custom to distribute meat to clan members. In Bomdo, we have the Panga, Medo, Lonchung, Duggong, Nyodo, Yalik and Tali clans, of which I belong to the first. My team has Petang and Sikung in it, both good companions, excellent hunters and good at carrying load, in case our catch is good. We were planning our last visit to the Sipu camp on the banks of the Angong river hoping to get lucky since the meat we collected, meticulously smoke-dried and cached in our camp was raided by a sun bear and we lost most of it. The evening before we left, Tigbo, a friend of mine from Bangalore, casually asked me if he can join me. I’ve seen Tigbo walk the mountains around our village and I think he can endure the trek we plan, so I tell him to get ready by 3 am the next morning and to pack only essentials since it was going to be a long trek. It was February, the time of the year best suited for hunting; no dangerous snakes, no rain and a pleasant cold weather. I had laid three dozen cable wire slip knot traps a fortnight ago and was hoping to trap a few animals. We have to return every fortnight to make sure the animals caught in the traps do not get eaten by other meat eaters in the forest. Also, sometimes we abandon our catch since the animals get trapped and then get rotten. The next morning at about 2.30 am, I reached Tigbo’s place, a Forest Department Inspection Bungalow built over an abandoned graveyard. I was glad he was up and ready but was worried about his huge backpack; whether he can carry it to the Sipu camp on the banks of the Angong river and back. We started our uphill trek along a torch-lit path and I was quite impressed with the way Tigbo was climbing up the hill, much faster than us, but I was still wary about how long his beginner’s luck would last. Two hours later we reached Yabo Roglé3, a resting place. Here we met another hunting party who had left earlier than us and from here on the eight of us were to walk till the Angong river together, for, our hunting camps are located close to each other. After climbing down from Yabo Roglé, three more hills had to be crossed to get to Angong. By this time, Tigbo had mentioned that his knees were hurting and was lagging behind. By about 8 am, we had crossed another hill and it was time for breakfast. Tigbo was by then limping and complained that climbing down was getting tougher. We had our breakfast, took a half hour rest and carried on. Since our team was now lagging behind, the other team went on ahead and will probably hunt the animals they find on the way with the single barrel gun they carried. At about 10 am we heard three shots and we were sure the other team had brought down something. 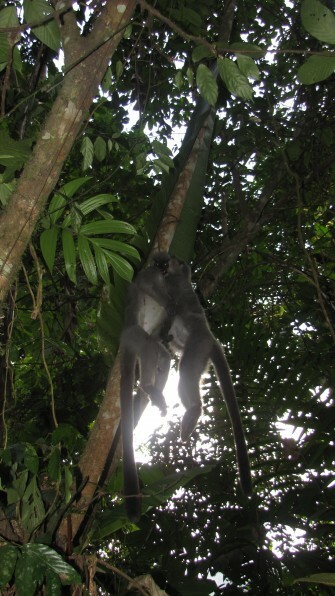 Ahead, we saw two dead capped langurs hung on a tree to be picked up by the team on their way back. We crossed two large streams and two hills in the next two hours and by about noon we were on the banks of the Angong river. The camp was another four kilometers from here. Petang and Sikung went on ahead and I walked along with Tigbo telling him that he is paying too much attention to his knees and that he should just loosen up his legs a bit. On a big stone along the bank I saw a message written for Tigbo by Petang to drop him at a camp that belonged to the Nyishis who were extracting cane from the area where he can spend the night and walk up till the road the next morning and get to Bomdo by road, 15 km away. But Tigbo would not give up and would also not give his huge bag to any of us. Two hours later, we finally reached the Sipu camp, few hours late, yet not all was lost. We quickly went back into the adjoining forest to check our traps and our luck with that was not that great too. All the traps were empty and untouched. We returned to the camp and did some angling in the Angong river hoping to get something interesting to eat for the night. Petang got lucky with a single medium-sized fish and with the dried meat that Tigbo brought along, at least two meals were assured. At about 4.30 pm, me and Sikung went back to the forest with our single barrel guns since we knew where the macaques roost. Me and Sikung hid in different positions waiting for the macaques to get to their roost site, it was very likely that one of us would get our shot right. While my eyes were focused on the largest male of the group, I saw the second largest male walking towards me and since I was downwind and still, he did not notice me. I took a shot and down he went. So finally we had a kill. We carried him back to the camp and finally we would have some meat for the Aran festival. That night we had a good sleep; we owe it to the 10 hour trek. A drink of rice wine, a sumptuous meal and a discussion over warm fire were our lullabies. Tigbo was fervently apologising for lagging us in return for our praises for his will power and endurance, for only a handful men had visited this camp. The beautiful Lady's slipper orchid, Paphipedilum sp. Morning began early and after a meal of rice and boiled mithun meat, we headed back. Our plan was not to return to the village but to a hunters’ camp mid-way since Sikung was having a bad episode of diarrhea and had therefore become quite weak. We were also carrying quite a heavy baggage back to the village since we had emptied our camp. 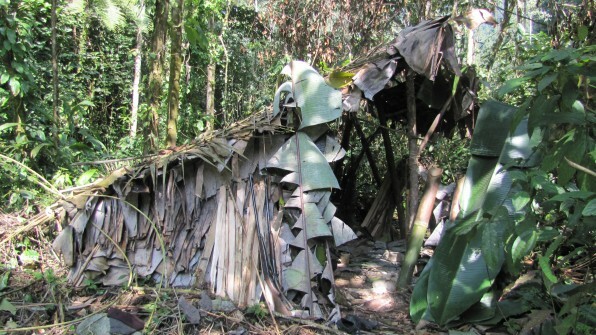 We reached the Imbung camp, which Tigbo thought was even more prettier and cosy. While me and Petang brought back firewood from the forest closeby, the two patients in our team; Tigbo and Sikung were in charge of cooking the evening meal! After the meal we had long conversations about the hunting trips we made the last three months, and in a way I felt that I will miss the makeshift camp we had lived in for several starry nights. The next morning we left from the Imbung camp at about 5 am and on the way we collected more than quite a few tubers of Minong(black ginger) which is of high medicinal value. On the way back I also showed Tigbo old shifting cultivation fields, located at least five hours walk from the village, these have been abandoned now since they are located too far from the village. I also showed Tigbo Taba, a tree fern, the bark of which was fed upon by the Adis in the days when food was scarce. 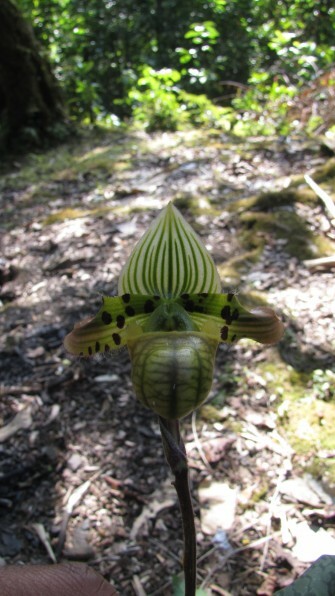 Tigbo also took a picture of what he called a lady’s slipper orchid, we had a nice laugh about funny common names in English at Yabo Roglé on the way back. We reached Bomdo by noon and my log ends here. Next year I plan to visit a much farther hunting camp, in a place called Arbo right below the Mouling peak, I think less than ten people from the village have ever been there. 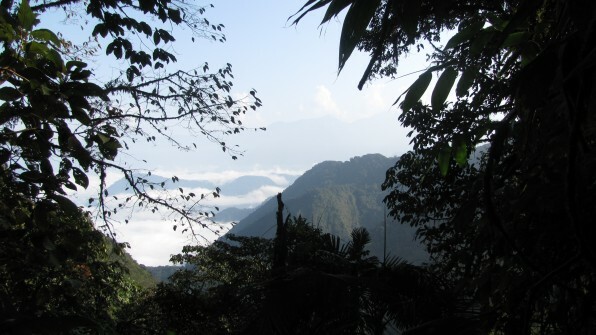 Its a two day trek from the village and I do wonder if Tigbo will join me, for, following us will be hard on his knees! 2. Aran festival is one of the most important festivals of the Adi community. The website http://www.bbc.co.uk/learningzone/clips/living-with-the-adi-preparing-for-the-aran-festival/8921.html has a video about the festival in Jorsing village in Arunachal Pradesh. 4. There were at least eight such hunting parties that made seven to eight visits to their camps during the winter. Hunting as labour-intensive as this and as far from the village is undertaken only for four months a year and the rest of the year, the hunting is limited to the village near abouts. 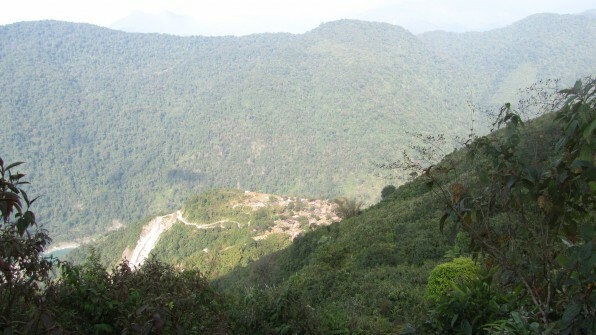 Also, relatively large tracts of forest including the Mouling National Park (http://arunachalforests.gov.in/Mouling%20National%20Park.html) surround the Bomdo village, which may mitigate the effects of hunting the locals may have on wildlife. Nice article. Just one comment (personal opinion). One fear I have in Arunachal Pradesh is the rate at which religious conversion are taking place and what would that mean for wildlife. Conversion to Christianity has it own benefits – people are freed of animal sacrifices which cost a lot to a family, health and hygiene standards go up, education amongst other things. However, when from wildlife point of view, all these taboos have essentially meant that locals are avoiding hunting certain groups of animals either for certain periods in a year or generally throughout the year (for instance hunting Gibbons is considered as a taboo by Mishmis and in Mishmi areas, Gibbons are extremely common as compared to non-Mishmi areas). This can mean a lot to at least stemming the rate of loss of these species. However, religious conversion free the community of these taboos and now suddenly all the species are available for hunting that too throughout the year. This would suddenly exacerbate the impacts of hunting on animals. completely agree with you. The other side of the coin is that school and medical care is often available only by Christian missionaries. I wish there was a way for these people to get these and still not convert. And yes, even among Adis this is the case, although relatively fewer people have converted. In the Siang region, we also have Donyi Polo groups and Hinduism groups propogating these two religions. But as long as the issue of education and healthcare is not well taken care of by Government, I don’t think people will ever stop thinking of the option to convert. This is of course a longer discussion which has several aspects to it. Thanks for your comment. So what can be done?? How should hunting be stopped?? To most of these tribes,hunting is as natural as playing soccer or cricket. I would like to know about some of the initiatives taken by NGO’s like NCF to stem this terrible assault on wildlife. Also of how far these initiatives have been successful. Hi Soumya, thanks for your comments. There are according to me several levels of hunting; hunting for subsistence/consumption, hunting for sale in local markets and hunting for trade. The first; hunting for the pot, is difficult to stop since in the north-east India, it is very much a part of the culture. And I don’t think it is taken as lightly as just a sport by most of the communities and tradition and customs are linked with hunting. It would be great to mention to the communities to spare the rarer species and allow their populations to recuperate. The other forms of hunting, for local market and for trade should obviously be stopped since there is no way to actually limit hunting when it is linked with income generation. Nature Conservation Foundation does have few programs related to hunting as a conservation issue, please visit the http://www.ncf-india.org website, for instance, in the eastern himalaya program (http://www.ncf-india.org/viewprojects.php?class=ecosystem&type=eastern+himalaya). Thank you for replying sir,however heartbreaking it may be to read a hunter’s diary,it still gives me some hope that some genuinely concerned people such as yourself and ngo’s like NCF are doing something to stem this terrible destruction of wildlife.